Summer leagues returning in 2018! 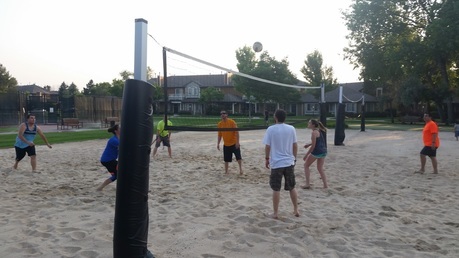 Join us for our Summer Sand Volleyball League! Come check this awesome sand volleyball league on the east side of Denver! 2 outdoor sand courts. We'll have the music bumping, bring a cooler and join us for this fun league at the Tava Waters Resort. 7 Week League with a big end of season Saturday tournament. We will be playing on Monday or Thursday Nights this session with game times at 6:00 PM, 6;50 and 7:40 PM. League start to be posted soon! Live at Tava Waters? Play for just $30! Conveniently located in East Denver, this park is easily accessible from most of Denver and Aurora! Want more information? Visit our registration page here, or give us a call at 303-923-5645! You can also e-mail us at MileHighSSC@gmail.com.